Looking for a last minute dish for your Mad Men party? Then this is not for you; get some shrimp cocktail and make up for it with a fabulous dress. If you want an utterly amazing 1960s dish worth prepping in advance for future Mad Men parties – or for life in general – read on and you will find amazing pastry secrets, and a recipe (for duck turnovers) in which to use them. 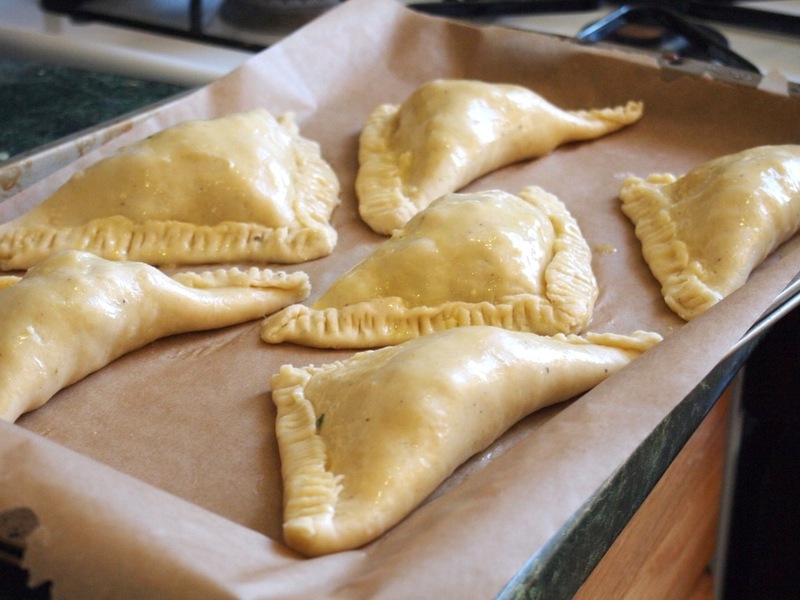 The recipe for the turnovers above came from my copy of the Gourmet Cookbook, Volume I; I have an edition from the 12th printing, from 1960 (originally copyrighted in 1950). This tome collects recipes from the first decades of Gourmet magazine, which was first published in 1941. Most of these recipes, are taken from or inspired by French cuisine, which was eminently fashionable in the middle of the previous century. One of my book’s previous owners, in fact, made note of the location of the Gourmet chocolate mousse recipe – a true 1960/70s classic – in the front cover this volume. I am a total sucker for handwritten notes, and try to add my own whenever possible; archaeology is all about excavating layers of built-up historical deposits, but sometimes it can be fun to add to that build-up instead of just uncovering it. Two additions I made to this particular recipe are pictured above: I used vodka and duck fat in my crust. The original recipe called for lard, but since I have a huge tub of duck fat in my freezer I thought I might as well try a different shortening. 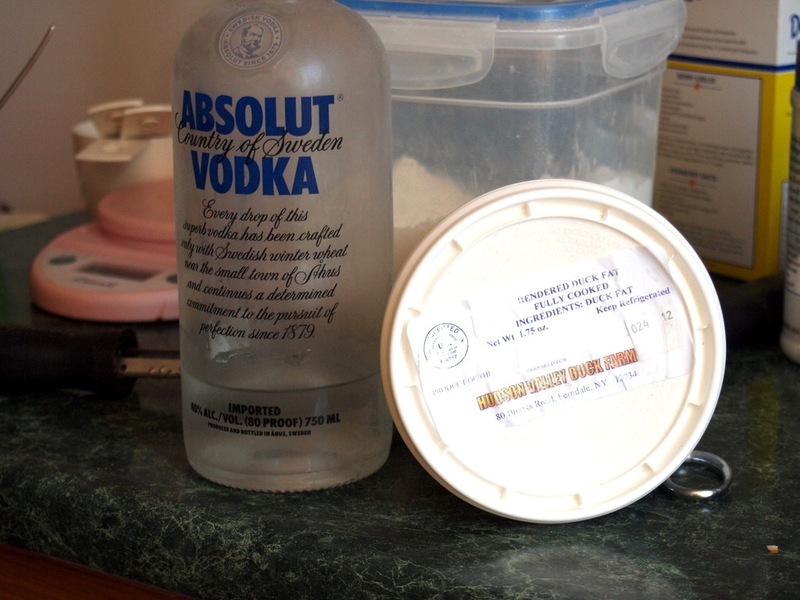 The vodka was from the Cook’s Illustrated recipe I’ve extolled in previous posts. Honest to Duck, this was the best crust ever – the duck fat, in combination with the spices the original recipe called for, gave this crust an awesome depth of flavor. The duck fat, in fact, did double duty: it worked with the vodka as well as the spices, and created one of the most cohesive yet flaky crusts I have ever made or eaten. And I have made and eaten a LOT of pies, hand pies, turnovers, quiches, and…you get the picture. 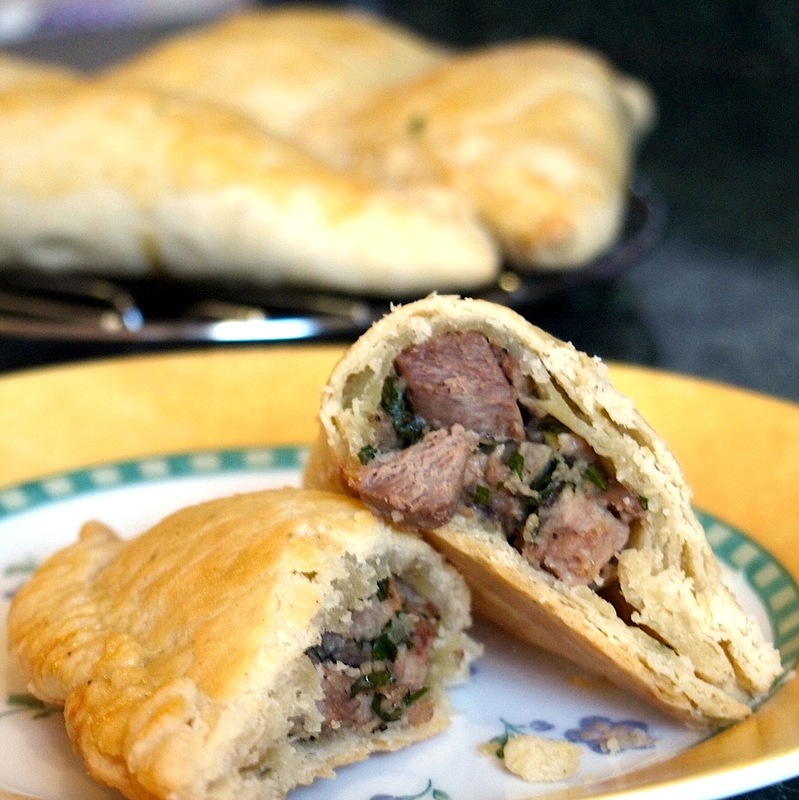 The original recipe called for use of leftover cooked duck in the turnover filling; I didn’t have cooked duck, but I did have a couple of duck breasts which had been sitting in the freezer since Christmas. I decided it was high time these got enjoyed, so I roasted them up special for this dish. I should also note – the recipes in the Gourmet Cookbook obviously assume a higher level of home cook culinary knowledge than modern recipes do; this recipe off-handedly suggests that one moisten the turnover filling with “duck gravy or rich cream sauce, highly seasoned.” Let’s list the assumptions packaged in this direction: (1) that if you have leftover duck meat, you probably have it from a roast duck, and you would never roast a duck and not use the pan drippings to make gravy; (2) you know what cream sauce is; (3) you know what is means to “highly season” something. Can you name others? I can’t. I should note, though, that if you’re still craving mid-century Gourmet oddities after this, you should head over to the excellent (and gorgeous) blog The Way We Ate…And mourn with me the fact that Mad Men is firmly in the late 60s. Flower children, mod, and Velvet Underground & Nico are all awesome – but I simply cannot work those color-blocked Twiggy-style mini-dresses the way I can the New Look. 1. Pulse the dry crust ingredients in the food processor with the butter and duck fat so the mix reaches a cornmeal-like consistency. Add the ice water and vodka, a couple of tablespoons at a time, pulsing about 5 times after each addition. Gather the resulting dough into a ball, knead it a couple of times, flatten it into a disc, cover the disc in plastic wrap, and chill for 30 minutes. 2. Preheat the oven to 350 degrees. Mix the filling ingredients in a bowl. 3. 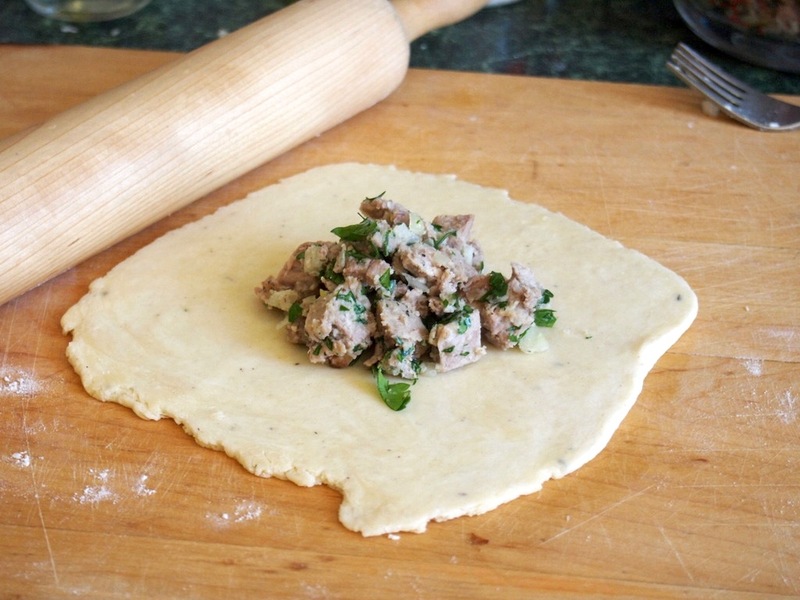 Divide the chilled dough into 6 equal pieces. Roll one piece out on a floured board into a roughly square shape, about 7 inches to a side. Place one-sixth of the filling in the center of the of the square. Moisten the outer edges of the square with cold water and fold two opposite corners together; fold the edges over and press the tines of a fork into them to seal the turnover. Repeat with the other five pieces of dough. 4. Place the filled turnovers on a parchment-lined baking sheet and brush the tops with the beaten egg. 5. Bake for about 15 minutes, until the turnovers are golden. Serve hot or cooled – they’re delicious either way. **I started out with two duck breasts; I oven-roasted them, and used the pan drippings, a couple tablespoons of flour, and a dash each of nutmeg, thyme, and cloves to make a roux – and then whisked in a couple tablespoons each of chicken stock and sour cream to make a small amount of thick, tangy gravy. They looks delicious.. Love their hearty and rustic charm! You are the most adventures and fearless chef! Turnovers look delish.